The Witcher 3 map is over 30 times larger than the original game and even bigger than GTA V. As you might expect the map is riddled with hundreds of points of interest; damsels in distress, merchants pedalling rare items and nests of pesky monsters. In this post I'll be covering all of the important locations on the map. The Witcher 3 does a good job of keeping track of your current position in the grand scheme of the Wild Hunt. There's both a contextual minimap and a larger world map which can be transversed using Fast Travel points. Important locations are only marked on the map after you discover them and any unknown locations are highlighted by a white questionmark. 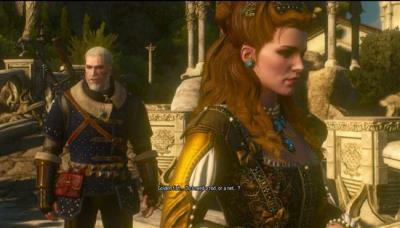 The image above shows the city of Novigrad, a free city located in the northern half of the world map. 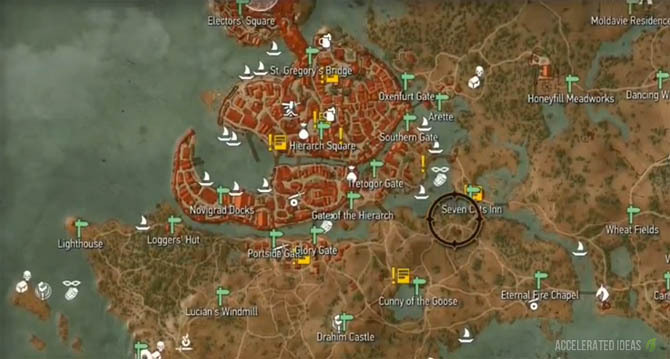 Novigrad is one of the biggest ports in the Witcher 3 and this can clearly be seen by the numerous boat icons surrounding the city. In the northern area of the city lies a Place of Power, offering players the chance to earn ability points. The southern area contains a blacksmith whilst the central area offers several taverns for purchasing alcohol and numerous merchants for buying and selling goods. South of Novigrad, just over the water, lies a more barren area of the map comprised of smaller towns. Points of interest include Cunny of the Goose, Seven Cats Inn and Widows Grotto. Its in this area where you start to encounter monster nests. The East of Novigrad contains little water and mostly flat plains. Of most interest in this area is the Place of Power at Alness and the treasure cave at Est Tayiar. As the name suggests No Mans Land is an uninhabitable area, full to the brim with monsters and monster nests. Lying just south of Novigrad this large wasteland consumes the majority of the Witcher 3 map. Seeing as No Mans Land is a high risk area it only makes sense that you'll find the majority of hidden treasure and secret items in this area. There are many caves and forests to explore but players needs to be wary of limited merchants, blacksmiths and other traders in this area until monster nests are cleared out. The central area of No Mans Land contains a sizeable forest near Dragonslayers Grotto, a Place of Power in Ancient Oak (just south of the central area) and several monster nests to clear out. The southern area of No Mans Land is an even split between water and land. Several large waterways disconnect the main locations allowing Fast Travel points to spread evenly from left to right. Two instances of a Place of Power are here: one just north of Byways and a second just south of Frischlow. There appears to be less monster nests and more opportunities for chests and hidden treasure especially in Fyke Isle and north of Byways. Many Fast Travel points exist on the western side of No Mans Land simply because of the compact nature of the locations. There are also many grindstones offering you the chance to improve your weapons strength. The Skellige Islands are split up into one large central island and several smaller islands surrounding it. 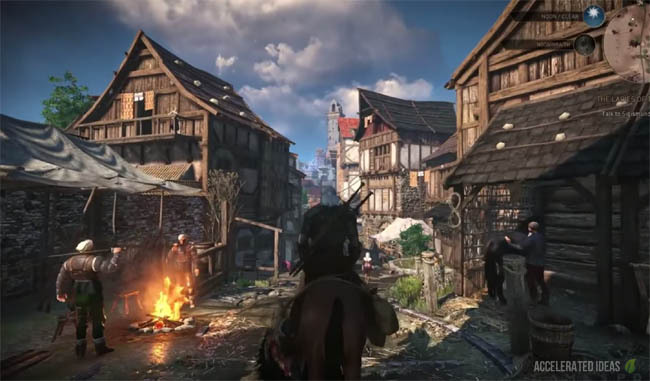 This region of the Witcher 3 is far more dangerous and harder to navigate than both Velen and Novigrad together. However, there are far greater rewards here including many of the high level upgrade diagrams for the school gear and some of the best monsters in the entire game. Many high level monsters have taken refuge in this area and as a result you’ll find many guarded treasure locations. You won’t find any notice boards or merchants selling wares on this island. However, there are many good rewards on this island including treasure hunts and loot chests. There’s also a secret Forge to help you unlock the Master Armorer back in Crow’s Perch. Monster nest - a location plagued by hordes of monsters. Can be destroyed for XP. The icon for a Place of Power is a little shrine. In each of the Places of Power Geralt can perform rituals to gain these bonuses, but some are locked away until you've developed your Abilities to a higher level. In addition to gaining bonuses, Places of Power also earn you Skill Points which can be used to unlock new Abilities for Geralt.